Tinytags monitor temperature and RH, and recorded information is used to help evaluate the effectiveness of new insulation material in a concrete church hall building. 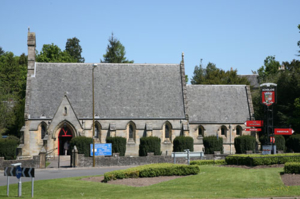 St. Mary's Church in Dunblane is a Victorian building and the church hall is a 1960s concrete structure, both presenting challenges in terms of occupants' comfort and energy costs. The church is an Eco Congregation, actively supporting energy conservation in the church environment and at home. It also has a close relationship with the adjacent St Mary's Episcopal Primary School, an Eco School, who were actively involved in the monitoring project. Energy conservation is of significant importance to the church community, and Tinytag data loggers were chosen to provide substantive information to help evaluate before and after conditions in the hall after a grant was made available to insulate the building. Two Tinytag Ultra 2 data loggers were positioned in the hall to record temp/RH patterns, in different locations that included close to the door, away from the door, beside where a group of elderly people sit, and also for comparison of indoor vs. outdoor data. Before and after records were included in the project report, with some of the recorded information about inside/outside conditions sent to the Department of Informatics at Edinburgh University for further analysis. The results are now under discussion with the Vestry Committee to determine any future course of action. John Hamilton, Rector's Warden/Property Convenor for the Church comments, "I chose Tinytags as I was previously familiar with them at work. Quite simply, they make the subjective - objective!"